When it smashed that projection the narrative shifted to the ridiculous success metric of achieving more than $1 billion. Cosmic Book News doubting a billion. Cosmic Books News: One of the only websites suggesting not reaching a billion was a cause for concern. No one had projected $1 billion as a metric of the film’s success. Most were projecting the film would land somewhere between $610 million and $900 million. Brie Larson’s superhero vehicle has now out performed even the most generous of projections – and it’s still going. It was ridiculous to suggest that Captain Marvel would be required to leap a higher bar than any other solo origin, first time on screen superhero film. In spite of the absurd challenge, the film scaled that height with barely a flick of Captain Marvel’s space stone powered finger. Of course, while no one was saying $1 billion was a “magic number” for Captain Marvel except sites hoping it would fail, there’s always room to move the goalposts if your narrative is collapsing. Now that Captain Marvel has hit $1 billion, Cosmic Book News is comically wondering if even that’s a realistic “magic number” and maybe we should be shooting for $1.5 billion or higher. 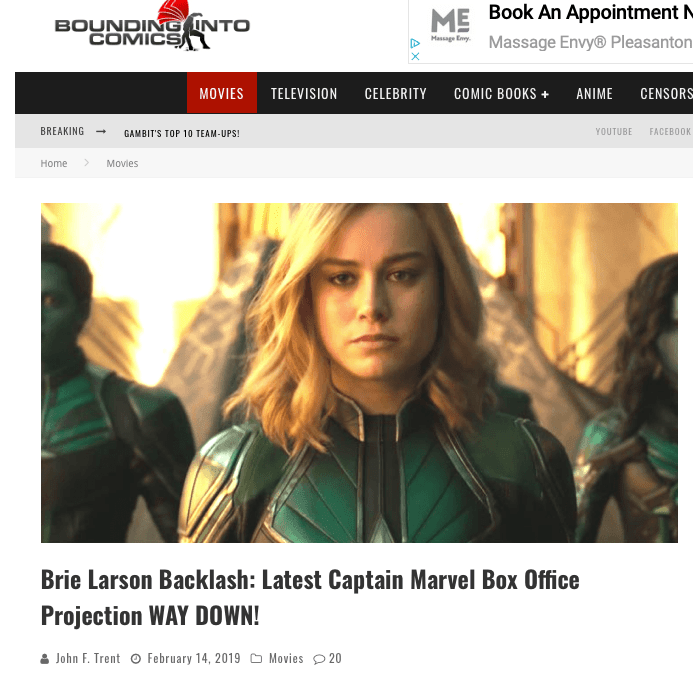 It isn’t a surprise that these websites would once again try to raise the bar for Captain Marvel. Cosmic Book News has a sustained track record of misrepresenting quotes and impressions about this film. Or even worse, promoting conspiracy theories generated by alt-righters like Jack Posobiec. You know Jack, he was one of the loudest voices to promote the Pizzagate conspiracy theory which led to a shooting at DC’s Comet Ping Pong Pizza. This time Jack, who’s convinced Disney is cramming “SJW bullcrap down our throats,” started a conspiracy theory that the House of Mouse is packing theaters and faking Captain Marvel‘s success. Cosmic Book News was more than happy to promote that agenda. Well, here we are. Captain Marvel is at $1 billion. If you’re mad about it maybe it’s time to do some internal reflecting? Or just take the easy path and keep moving the goalposts.